I'm taking a day off and am going to London for one day. Flying down in the morning and flying back in the evening, I've got exactly 10 hours to hunt down records in various second hand shops in the world's capital of music (Or at least it used to be before the music industry went belly-up). I've prepared a few posts for you all to read in my absence. And of course I had to make a few appropriate ones. 'Streets of London' is one of the most classic songs about London. 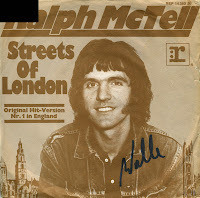 It was performed by Ralph McTell (born December 3, 1944) in 1969 on his album 'Spiral staircase' but it was not released as a single in the UK until 1974, when it reached number 2 in the singles chart. In the Netherlands, it reached number 9 in 1972.